Logitech has a great market standing and is one of the most reliable brands when it comes to manufacturing computer peripherals and accessories. Gaming mice is what people (or preferably gamers) need in order to play games or sometimes just for their day-to-day tasks. Logitech is an excellent provider of gaming mice and has an outstanding arsenal of these little weapons. The good thing is that Logitech pays a lot of importance towards keeping the build quality and the in-hand feel of the mice great. The lighting effects and the gaming drive software provided with the bundle are also splendid. Here, we are going to talk about the two considerably famous gaming mice by Logitech- The G403 and G703. 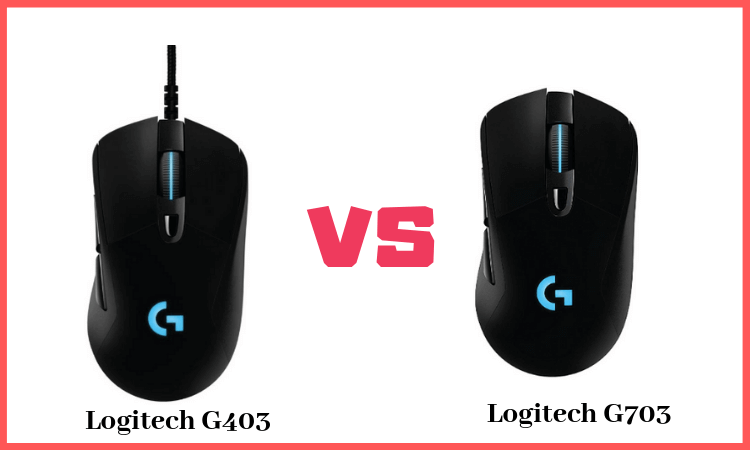 In this detailed post we have done a detailed comparison between Logitech G403 Vs G703. Both the gaming mice have their own set of advantages and disadvantages. To help you understant better, we would first cover the individual reviews and then later compare both the gaming mice and their features. We would first like to point out that the G403 is not a single gaming mouse, i.e. there are two different variants of this mouse- the wired and wireless version. The price also varies accordingly. The Logitech G403 has a very classic design as the shape and the grip of the mouse are really good. These days most of the gaming mice have a weird shape for some reason. The companies try to make these gaming mice aesthetically cool for gamers but the G403 prodigy goes opposite and offers a very sleek and clean design with good RGB lighting that in total makes the G403 prodigy look decent. All in all, there are six buttons on this gaming mouse. The left button & right button, a clickable scroll that acts as a button, a dots per inch or DPI sensitivity shifter and two thumb buttons. 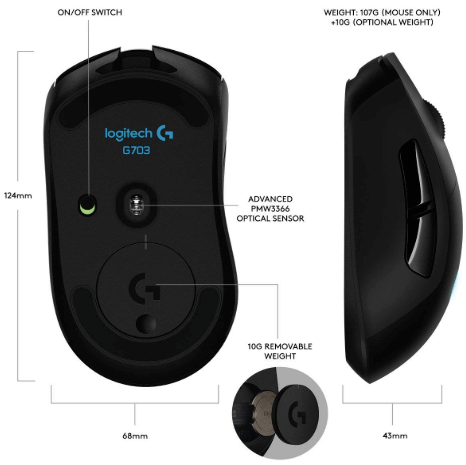 Overall, the clicks are satisfactory and the buttons are also sturdy, all thanks to the excellent build quality provided by Logitech. The software bundled with this gaming peripheral by Logitech is pretty stable and operational. It lets you adjust the DPI which ranges from 200 to 1200, link individual profiles to games, lets you control the whole light show and manage the color patterns. If you still want a better DPI range, you can go for the Razer DeathAdder Elite which is also a premium level gaming mouse. If you are using the wireless variant of the G403 prodigy then this software will also display the correct battery percentage of the gaming mouse in your hand. The sensors are quite good and if we go by Logitech’s reports, the sensor sends 1000 reports per second. This makes the functioning pretty smooth. The DPI toggle button is located just above the mouse scroll. There are three presets which let you toggle the sensitivity of the gaming mouse. This as an approachable option if you want a decent gaming mouse with a clean build and no oddly shaped grips or cuts on the body. Though there is hardly much difference between the wired and the wireless version, here is quick comparison between the two. Lightweight with rubber grips on the sides. Adjustable lighting with 16.8 million colors. Has six buttons on the body each having a different purpose. Has built-in onboard memory stores so that you can store commands for five of our favorite games. Works perfectly with Windows 7, Windows 8, Windows 8.1 and Windows 10 or later. Removable weight upto 10g supports additional better grip and comfortable. Store custom commands for your favorite games. This gaming mouse is pretty quick and highly responsive. The grip adds a nice feel and makes the in-hand experience better. The software is robust and very intuitive. The RGB lights really stand out. The wireless variant has good battery life. The thumb buttons are unsatisfactory and their placement could have been better. Left-handed people will have a bit of a problem in holding this gaming mouse as it is designed specifically for holding in the right hand. Most of the wireless gaming mice are expensive these days and if you mistakenly buy a cheap one, most probably you would not get the desired performance. Surprisingly, this is not the case with the Logitech G703 Lightspeed gaming mouse. 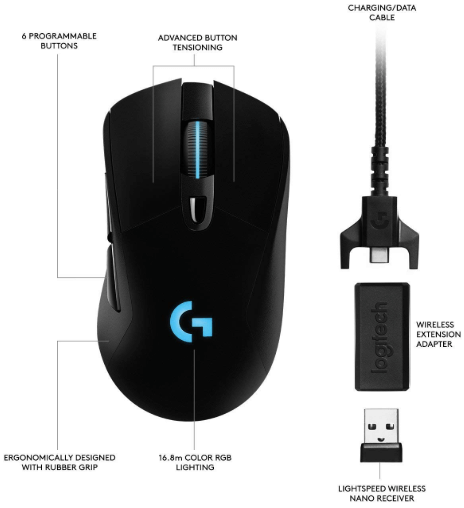 Unlike the Logitech G403 Prodigy, the Logitech G703 Lightspeed comes only in a wireless variant. There is no wired model available. Some of you may find the design a bit bland as it is completely plain. Still, the body offers great grip and makes it very convenient and comfortable to hold. To be honest, the mouse has a very generic design and looks like most of the standard PC mice out there. The RGB lighting is available in almost all the $100 mice these days but the lights in the G703 really stand out. You can set the pattern of the lights on this mouse or your game can also be allowed to control the lighting according to the situations in the game. There are a total of six fully functional buttons present- a right click button, a left click button, a clickable scroll in the middle of the two buttons, a DPI adjusting button just below the scroll and two huge thumb buttons on the side. 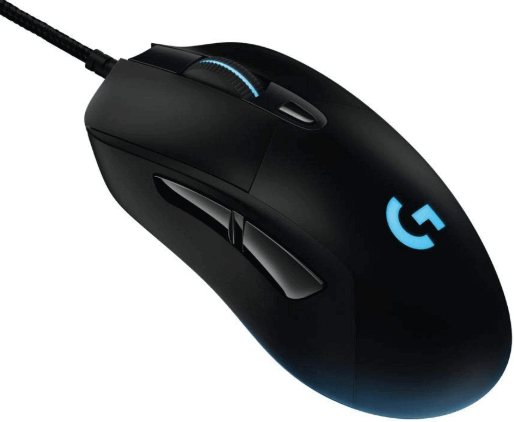 Logitech’s Lightspeed technology has been used in the G703 gaming mouse. You may be having the notion that wired mice are more sensitive than the wireless ones and also that the wired mice are more dependable. But, the Lightspeed technology introduced by Logitech has proven to be faster than the wired competitors. The result varies only by milliseconds. There is a Powerplay wireless charging system. Those of you who will buy the G703 Lightspeed will get a USB dongle along with the bundle so as to charge the gaming mouse. Another option is buying the Powerplay surface which easily charges the gaming mouse. This is a feature that makes the G703 lightspeed very different from the G403 wireless gaming mouse. Using the Powerplay system is a bit eccentric. While the gaming mouse is being used on the Powerplay surface, the charge would remain the same and would not rise or drop. For it to charge, you will have to leave it still on the top of the surface for a few hours or more because the charging speed is a little slow if we compare it to the routine USB charging. The Powerplay system is also slightly expensive which will be almost double the price of the gaming mouse bundle. 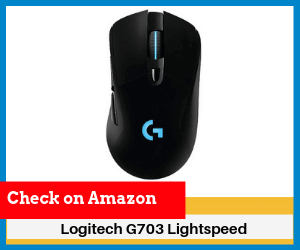 If we talk about the pricing of the Logitech G703 Lightspeed gaming mouse, we would say that it is definitely a worthy pick and is surely offering all the prime features that should be present in a standard gaming mouse. The sensors and all the RGB lighting effects are splendid, even the sensitivity is is good and you will face very less latency. Although, we would not recommend you to buy the Powerplay surface if you are a bit tight on budget as this surface almost doubles the price of the whole package. This gaming mouse has groundbreaking Lightspeed technology provided by Logitech. PMW3366 optical gaming sensor has been used which has a DPI range of 200 to 12000. It has a lightweight design and has rubber grip. Has a dazzling RGB system which is fully customizable using the Logitech gaming software. There are six buttons present on the body. The G703 Lightspeed is very durable and also pretty comfortable to hold. The PMW3366 sensor is one of the best gaming optical sensors in this price range. The Lightspeed technology makes the G703 even speedier than the wired gaming mouses. The Powerplay technology really makes things easy for gamers. The RGB lights are radiant and add up to the beauty of this little beast. These lights can also be customized according to your usage or the game you are playing. The G703 Lightspeed has a very generic look and it does not look like those groovy gaming mouses available in the market. Left-handed people would have to learn how to use their right hand or just simply compromise as the mouse is made for right handed people. After reading the detailed reviews, you must have noticed that these two gaming mice by Logitech aren’t much different from each other. Moreover, the wireless variant of the G403 Prodigy is just like the G703 Lightspeed. 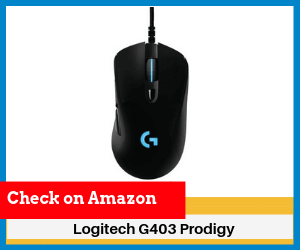 The major difference between both the gaming mice is that the Logitech G703 Lightspeed provides some extra features which are not available with both the wired and wireless variants of the Logitech G403 Prodigy. The Lightspeed technology and the powerplay support are the two major features that you won’t get in the G403 Prodigy. These features do have a very big impact on the overall performance and comfortability. There is also a slight difference in the price. We suggest you check the same on Amazon and then decide. Overall, there isn’t any big diffeence in terms of features between both the G403 and G703. Rest of the sensors and the design are almost similar in both the models. The G703 is a little better for agressive gamers as it supoorts upto 50 million clicks as compared to just 20 million in the G403. When choosing between both the gaming mice firstly you would need to decide whether you want to buy a wired gaming mouse or a wireless one. If you want an economical wired gaming mouse then you should definitely pick the G403 Prodigy wired variant. If you want to go for a wireless gaming mouse then the G703 Lightspeed is definitely worth buying. We hope this post must have helped you choose between the G403 and G703. If you still face any confusion, do share your doubt’s in the comments section below. You can also check out our detailed posts on choosing the right gaming sound card and cooling fans which will also add value to your gaming experience. Important: The images used in the post are taken from Amazon and stock photo sites. Well, now I have decided to go for the G703 as it is already on sale.